Looking for a new camera can be quite the process. First, you need to establish a price range and what level of camera you’re looking for (entry-level, advanced, etc. ), and then you need to determine what is important in a camera for you. Do you want lots of features to play around with? Are you looking for excellent imaging to satisfy your keen eye? Or, do you just need something to get the job done? Once you’ve established all this, it’s finally time to start looking at the cameras on the market. And there are so many of them. What is the Panasonic FZ300? How Does the Panasonic FZ300 Compare? Trying to investigate every camera can seem a little daunting, especially if you want to look outside the camera’s website to get a fair, unbiased opinion about it. That’s why we’re here. In the following article, we will be reviewing the Panasonic FZ300, detailing the good and the bad, so that you can put your mind at ease and make an informed decision. The Panasonic FZ300 is a small sensor superzoom compact camera that made its debut in 2015. It is marketed as a small camera that is perfect for being on the go and utilized in the outdoors. Like many other Panasonic cameras in recent years, the FZ300 offers a variety of 4K modes for shooting video and photography. While engaging these 4K modes, images are brought into cleaner and sharper relief for higher imaging quality than when the modes are not engaged. One of its proudest features is its ability to zoom in at a 24x magnification rate without blurring, so you can capture all the fine details of something nearby that you want a close-up shot of, or of something in the distance that you want to see more clearly. Working with this, it also features optical image stabilization features to that you don’t have to worry about your images blurring. The Panasonic FZ300 has a 3’’ LCD touchscreen for optimal user-friendliness. The screen is also fully articulated, so you can move it around completely. This provides ultimate variety in shooting positions and is great for taking group selfies and ground-level photography. Working in tandem with the LCD screen is an electronic viewfinder. Electronic viewfinders are great for framing your shot for photographers who like to have their eye up to the lens or for when its bright out and the LCD screen may be difficult to see. With the Panasonic FZ300’s 4K picture taking modes, the camera shoots at a rate of up to 30 frames per second (fps) so that you can go back through and select the best frame that represents the moment you caught. These 4K modes come in three variations: Burst, Burst S/S (Start/Stop), and Pre-Burst. These bursting options allow you greater agency over your picture taking experience. As for the 4K video mode, it provides viewing that is 4x the size of Full HD for extreme precision to capture all those details and render vivid footage. You can also take panoramic shots by simply panning the camera across any area. The “rugged” design of the camera entails splashproof/dustproof resistance. The camera has tight, weather-proofed seals around every joint so that you don’t have to worry about taking photos out in the great outdoors. The build of the Panasonic FZ300 is meant to be intuitive in nature. The right side of the camera is curved to provide an easy grip, no strap required. The camera can be operated through a series of dials and rings on the right-hand side, with four additional buttons that you can individually assign functions to based on your preference. The left side of the camera’s lens features a lever that offers greater lens control as well. The camera is also compatible with the Panasonic Image App available on smartphones and tablets. With it, you can perform remote shooting. This is ideal for nature shots in which you don’t want to disturb your subjects. So, simply set up the frame of your shot with your camera resting on a tripod or other mount. Then safely watch from a distance, choosing to let your camera shoot whenever the moment arises without interference. This app also makes sharing photos directly to social media nice and easy. The Panasonic FX300 sports a 12MP - 1/2.3" CMOS sensor. The camera is able to capture images in RAW format and develop in-camera for higher imaging capabilities. While its 24x magnification capabilities make it ideal for capturing detailed images from far away, this Panasonic is also ideal for taking close-up photography. There is a minimum of only 1 cm focusing distance, so you can get that detailed shot of something small and close. Outside of the 4K modes, the camera still offers a continuous shooting rate of 12 fps. The Panasonic FZ300 is also ideal for shooting in low light conditions. Through the combination of the camera’s sensor and its Venus Engine, the Panasonic FZ300 excels in diffraction compensation to provide clear and vivid images in low light settings. Through its Depth From Defocus (DFD) Auto Focus mode, the Panasonic FZ300 is able to focus in on images quickly for when you need to suddenly pull out the camera and take an action shot that can’t wait. This camera also offers awesome optical image stabilization in the form of its 5-axis tilt correction. The camera will sense any tilting that may be apparent, especially from one-handed shooting, and correct it using the 5-axis. This mode also translates into video recording. Weighing a whopping 691g, this camera is rather heavy compared to other classes of compact cameras, though it’s right around the range for small sensor superzoom cameras. Still, it is on the heavy side even for those, and you should keep this mind if you intend to go lugging the camera with you as you travel in the great outdoors. The Panasonic FZ300 has a battery life of 380 shots per charge. This is a pretty good battery life compared to other compact cameras, which often tend to hang around the 2-300 shots per charge range. This camera is compatible with a variety of accessories, including an external flash, external mic, and Panasonic conversion lenses. Outdoor photographers seem to really like this camera for its features and durability. They like the ever-popular 4K modes, the user-friendly nature of the design, and the RAW imaging abilities. There are a few complaints when it comes to the operation of the camera, such as the lever on the side of the lens, which some feel is not very easily operable. A few others have also cited the camera being slow to function at times, though they are in the minority. 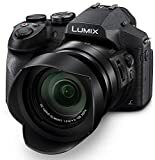 You can find the Panasonic FZ300 online at the Panasonic website for $399.99, or for the slightly lower price of $ on Amazon. So, now that we’ve taken an in-depth look into the Panasonic FZ300, how does it compare to the competition? You can’t make a truly informed decision until you take a camera out of its own context and see how it fares side by side with others. Below, we’ll be directly comparing the Panasonic FZ300 to the Canon SX60 HS and the Nikon B700 to find out. But first, here are a few general ratings about the Panasonic FZ300 to keep in mind as we move through our comparison. The Canon SX60 HS and the Panasonic FZ300 are both small sensor superzoom compact cameras that use a 1/2.3" CMOS sensor. Both cameras offer optical image stabilization features, an electronic viewfinder, and a 3’’ fully articulated LCS screen. The both also have an ISO range of 100 – 6400 and feature built-in wireless technology. The cameras have an external mic port and hot shoe, and they are able to support RAW footage and images. The Canon SX60 HS outpaces the Panasonic FZ300 in a few key regards. For starters, the Canon has a max sensor resolution of 16 MP, while Panasonic only offers 12 MP. The Canon also offers a far superior zoom rate of 65x, versus the Panasonic’s rate of 24x. The Canon camera furthermore provides better wide and long-range focal length. Lastly, weighing in at 650 g, the Canon is 41 g lighter than the Panasonic camera. The Panasonic FZ300 outmatches the Canon SX60 HS in terms of features. In addition to its 4K mode, it also offers a post focus mode, time-lapse recording, and touchscreen that the Canon lacks. The Panasonic also has better video resolution (3840 x 2160 vs 1920 x 1080), a greater number of focal points (49 vs 9), faster shutter speed (1/16000s vs 1/2000s), and regular continuous shooting rate (12.0fps vs 6.4fps). With a battery life of 380 shots per charge, the Panasonic FZ300 will outlast the 340 shots of the Canon. The weather-proof build of the Panasonic is also another huge advantage that it has over the Canon. The Nikon B700 is another small sensor superzoom camera that features a 1/2.3" CMOS sensor. Both cameras feature optical image stabilizations features, a 3’’ fully articulated LCD screen, and an electronic viewfinder. The cameras both also offer RAW support, time-lapse functions, manual focusing and exposure options, wireless connectivity, and a high video resolution of 3840 x 2160. The Nikon B700 mainly pulls ahead in the same ways the Canon SX60 HS did. Its 20 MP max sensor resolution is much higher than the Panasonic’s 12 MP. The Nikon also has a superior optical zoom, offering a magnification rate of 60x to the Panasonic’s rate of 24x, as well as better wide and long-range focal length. It also has improved wireless capabilities, offering Bluetooth and NFC connectivity. Finally, it weighs only 565 g to the Panasonic’s 691 g.
The Panasonic FZ300 exceeds the Nikon B700 in numerous ways. To start, it offers 4K and post focus modes, as well as a hot shoe and mic port, which the Nikon does not. It also provides superior max ISO (6.400 vs 3.200), shutter speed (1/16000s vs 1/4000s), continuous shooting in a normal mode (12.0fps vs 5.0fps), and sensor pixel area (2.34µm2 vs 1.39µm2). Additionally, it has better wide and long-range max aperture and that all-important weather-proof design. The Panasonic’s battery life of 380 shots per charge outlasts the Nikon’s by about 30 shots. Now that we’ve seen how the Panasonic FZ300 stacks up against the competition, let’s do a quick once-over of this camera’s most notable pros and cons before we provide our closing thoughts. A major pro is, of course, the 4K modes, which lend greater imaging capability to a camera that otherwise wouldn’t have as a great quality. We also love the user-friendly nature of the product, such as its fully-articulated touchscreen. Its rugged weatherproof design is another reason to love this camera. While the Panasonic FZ300 offers a high magnification rate of 24x, this is far outmatched by other cameras in its class. There have also been a few complaints on the speed at which the camera functions and a few design critiques. We also wish that this camera offered a higher sensor resolution. When it comes down to it, this is a great camera if you’re looking to do some outdoor photography. With its weatherproof and rugged design, you don’t need to worry about the Panasonic FZ300 taking a little splash as you get those great action shots. Available for $397.99, this is a pretty good bargain for all its features. Panasonic FZ300 is a user-friendly camera with a fully articulated touchscreen. It has 4k modes and it features a rugged weatherproof design. One of its drawbacks is having a low sensor resolution.